Foreign Affairs Minister Chrystia Freeland ventured Wednesday onto Donald Trump's home turf, denouncing his "absurd" tariffs and forcefully arguing for preservation of the world's rules-based order — with or without the United States. 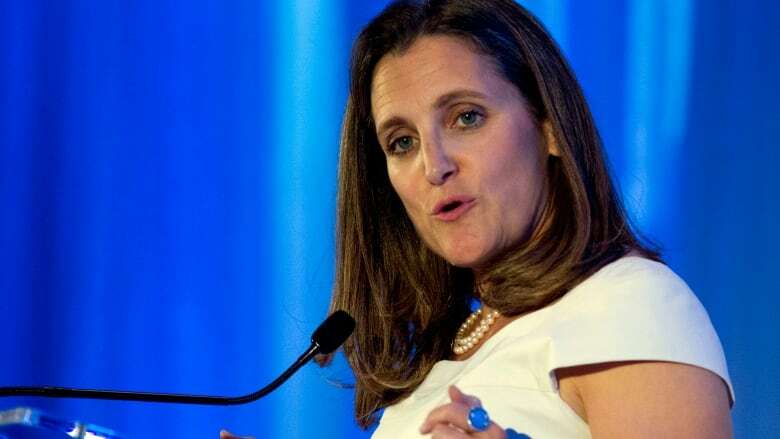 Canada's Foreign Affairs Minister Chrystia Freeland ventured Wednesday onto President Donald Trump's home turf, denouncing his "absurd" tariffs and forcefully arguing for preservation of the world's rules-based order — with or without the United States. Freeland reiterated Canada's strong opposition to the American president's steel and aluminum tariffs after meeting with the influential U.S. Senate foreign relations committee in Washington on Capitol Hill. She was the first Canadian politician to set foot in the American capital after Trump and two of his top economic advisers launched unprecedented personal attacks on Prime Minister Justin Trudeau for criticizing the tariffs at the weekend G7 summit in Quebec. The minister stayed above the fray on those attacks, but she did not hesitate to repeat Canada's opposition to the tariffs in the bluntest of terms — in particular the use of Section 232 of U.S. trade law to justify the action on national security grounds. Later Wednesday evening during a major foreign policy speech, Canada's top diplomat broadened her focus with a sweeping defence of something Trump has little time for — the international rules-based system that the U.S. led in creating after the Second World War. She told a crowd of diplomats, academics and politicians blocks from the White House that she realizes that some Americans no longer think that world order is of any benefit to them, even though they helped create it and wrote "the biggest cheques" to support it. "We see this most plainly in the U.S. administration's tariffs on Canadian steel and aluminum," Freeland said in her acceptance speech for winning the Foreign Policy magazine's Diplomat of the Year award. "They are a naked example of the United States putting its thumb on the scale, in violation of the very rules it helped to write." Freeland argued that the United Nations, the World Bank, the World Trade Organization and other global institutions created in 1945 were never perfect. But she said those institutions remain the guardians of liberal democratic values at a time when populism and authoritarianism "is on the march" in Russia, China, Venezuela and elsewhere." "We all know we will be strongest with America in our ranks — and indeed in the lead," she said. "But whatever this great country's choice will turn out to be — let me be clear that Canada knows where it stands." Freeland gave a thinly veiled thumping to Trump's America First foreign policy. "You may feel today that your size allows you to go mano-a-mano with your traditional adversaries and be guaranteed to win. But if history tells us one thing, it is that no one nation's pre-eminence is eternal." Freeland never mentioned Trump by name. But she evoked the great Republicans who came before him — from Abraham Lincoln's Gettysburg's Address to Ronald Reagan's 1989 "City on the Hill" farewell speech where he envisioned a country "built on rocks stronger than oceans, wind-swept, God-blessed, and teeming with people of all kinds living in harmony and peace." She won applause when she said, "preserving Lincoln's vision" means fighting back against those who try to hijack democracy. "Facts matter. Truth matters. Competence and honesty, among elected leaders and in our public service, matter." The speech followed the closed-door Senate foreign relations meeting, where the same authoritarian threats were discussed. So too, were the current U.S. metals tariffs on Canada, Mexico, Europe and Japan. "The Section 232 action — which is, let me remind people, a national security consideration — is frankly absurd," Freeland said on Capitol Hill after the meeting. "That action is also illegal under the WTO and NAFTA rules." The majority of U.S. senators agree with that view, said the committee's Republican chair, Sen. Bob Corker. "I do think it's an abuse of presidential authority to use the 232 waiver, and I've tried to pass a piece of legislation on the floor to counter that," Corker said after the meeting with Freeland. He said he is trying to gather support for legislation that would give U.S. Congress, not the president, the authority to impose tariffs under the national security clause of U.S. trade law. Corker isn't seeking re-election in this fall's U.S. midterm elections and has railed against his fellow senators who are headed to the polls and worried about their electoral success for not standing up to Trump publicly. Corker said there's no question Trump has damaged relations with Canada, but he hoped cooler heads would prevail. "Canada is not a country that we have trade issues with," he said. Canada and its allies plan to impose retaliatory duties by the end of the month on a broad range of consumer goods. The Trudeau government has proposed a $16.6-billion tariff package, in retaliation for the Trump administration's decision to impose 25 per cent import duties on steel and 10 per cent on aluminum. Freeland said Canada was responding in sorrow rather than anger but that the government would respond dollar-for-dollar to the U.S. tariffs. Finance Minister Bill Morneau was in Washington to join Freeland for her award ceremony. Earlier, Public Safety Minister Ralph Goodale told a Fox News business show that despite the dispute over the tariffs Canada still wants to make a deal to resolve the renegotiation of the North American Free Trade Agreement. On Thursday, Freeland is expected to meet U.S. trade czar Robert Lighthizer in an effort to keep the NAFTA renegotiation on the rails.